We only show our our best self on social media. Join us as we take a filter free look at family. marriage & parenting. Wear your favorite Super Hero costume or t-shirt. There will be photo ops, snacks and prizes in each area for the best costume! We would be honored to celebrate with you as you take your next courageous step in a growing relationship with Jesus Christ! *Once you print out your application and return it to Cody or Amber, our student missions team will review it and you will be notified via email with your next step. Are you ready for your student to go on a mission trip that will give them the opportunity to do real ministry and explore their faith in a deeper way? Join us as we partner with House of Faith in San Angelo and experience a mission trip that is built on our three pillars: genuine partnerships, long term relationships, and sustainable ministry. Kid's Camp is a fun filled week for kids who just completed Kindergarten through 3rd Grades. Each night we will enjoy great worship, fun teaching and awesome recreation. Your kids will have a blast and come home wiped out! Adults and students are welcome to sign up to volunteer as well. It takes a large group of volunteers to make Kid's Camp happen and we would love for you to join us! Grace Students will be traveling to Camp Akiva for an unforgettable week of squad games, engaging services, chances to hang out with their friends, and a whole lot of fun at our 2019 Summer Camp, July 14-18th. If you're in 6-12th grade (18/19), this camp is for you! We're heading to Point, Tx (East Texas) where students will enjoy challenge courses, water slides, waterfront ponds, a zip line, and more. We'll also have great teaching, powerful worship, and plenty of fun surprises along the way. *Anyone registered after June 1st is not guaranteed their requested shirt size. Camp KidJam is children’s camp designed not only for current 3rd – 5th graders, but for their leaders as well. We will stay in the college’s dorms. This is an action packed week where your kids will grow in their faith as well as in their relationships with their peers and leaders. Camp KidJam is designed to provide a fun experience for kids, unique leader training to develop adult leaders and to elevate the significance of Small Groups for children. There is a $50 deposit required to reserve a spot for camp. This summer we will be partnering with Mission of Hope to go to the Dominican Republic. Easter is always HUGE at Grace Fellowship and this year is no exception! Men, you're invited for breakfast with old buddies and new friends, swapping stories, and some time to pray for one another and our church. Men's Prayer Breakfast is on the second Saturday of each month. Don't worry about lunch plans because we're bringing the food to you! The hard part will be deciding what you want to eat. Discover how you can become an important part of God's amazing story here at Grace Fellowship, and how we can help you take your next steps in a growing relationship with Jesus Christ. Completion of this class is a requirement for membership at GF. We lose an hour for Daylight Savings Time. Spring forward, save some time, and come to church in your PJ's and enjoy Pop-Tarts for breakfast. You have experienced a growing relationship with Jesus Christ, and now you want your children to have the same experience. Our Child Dedication Celebration is a fun, practical, applicable and meaningful training and celebration. At the Dedication Celebration, you will commit to raising your children to know who Jesus is and to follow Him, with the support of your family, friends and church. Have you ever felt like the Christian life wasn’t all it was cracked up to be? You aren’t alone. But maybe the problem isn’t with God’s promise of a full and satisfying life, but with the way we are living. In this series we will look at a way of living that leads to the promise. The Connect Event is your opportunity to connect to a LifeGroup to grow your relationship with Jesus Christ. This will take place after each service in the atrium. It’s easy! Just fill out a Connect Card & our expert connections team will place you in an incredible group! Live near Dallas-Fort Worth? We'll be hosting a one-day event for pastors of small and mid-size churches on January 24, 2019 at Grace Fellowship in Paradise, TX. We'd love to meet you! Speakers include Dale Sellers, Terry Thompson, and more! A gathering for women to connect, grow, and be encouraged. We love offering little nuggets of advice, support, or sympathy. They come in handy when we want people to feel better. But what if the guidance you’re giving or receiving just isn’t true? What if it was Fake News? A free fun way to burn off some winter break energy! Join us for a day of bouncing, all inflatables will be indoor. This will be a Christmas service like we’ve NEVER done before! Invite your friends and family to an experience that you don’t want to miss this Christmas. Magician John Michael Hinton will be performing for 4th-8th grade during each service time. Magician, John Michael Hinton will be performing in each of the main worship services as well as doing a special performance for our 4th - 8th graders during each service. Buy your Classy Christmas outfit from any thrift store. Grace Fellowship T-shirts & Hoodies! Don’t miss out on your opportunity to purchase some GF swag. These would make great Christmas gifts, too! Very soft, comfortable, and great quality short sleeve t-shirts, long sleeve t-shirts and hoodies. Have you ever looked at the Christmas story through the eyes of those who were involved in it? Have you ever placed yourself in their shoes? In this exciting, insightful, and imaginative series we will discover how this baby changed everything. Sundays at 8:30, 10:00, 11:30 AM. Be Rich is here again! 100% of the proceeds given will go directly to organizations that support, help, serve, and protect our community as well as a couple of our key missions partners. Because of the generosity of the people of Grace Fellowship, we’ve been able to give almost $100,000 over the past 3 years! Don’t miss this opportunity to give a gift and experience what it really means to Be Rich! or, Text the word “GIVE” to (940) 242-2212. High School Students, register now for Armed, our GS High Winter Retreat. It’s going to be an incredible time with a guest worship band, a special guest speaker, games, service projects, food, and whole lot of fun! Have a heart! Roll up your sleeves and give a little bit of that life-giving blood that can help someone in need. We’re just trying to add a little fun to time change! So remember to set your clocks back on Saturday night, let the kids wear their PJs to church on Sunday, and we’ll be serving them Pop-Tarts. Remember to set your clocks back an hour…and get an extra hour of sleep! Orrrr, not…and show up to church an hour early! Ladies, you’re invited to an encouraging and fun one-night event at Grace Fellowship with a special guest speaker and guest worship leader. Bring a friend…or, a whole group of friends! Online registration is closed (but you can register at the door). 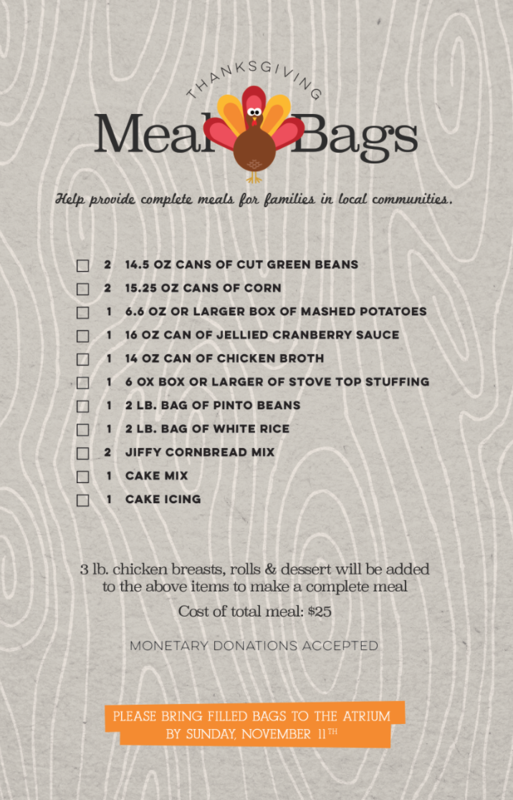 We have an opportunity to help provide Thanksgiving meals for those in need in our community. Pick up your bag and shopping list between 10/21 and 11/4 and return your filled bag by no later than 11/11. Simple! It only costs approximately $25 to fill a bag. Let’s overwhelm our community with our generosity! ...all destructive toxins. They can infiltrate your life & damage your relationships. Left unchallenged, they have the power to destroy your home, your career, and your friendships. Pastor BJ will lead us through practical ways to to guard our lives against the toxic power of guilt, anger, greed, and jealousy. Register now for this GS Middle (6th - 8th grade) retreat on October 19th-20th. Believe is a 2-day event with worship, games, fun and a whole lot of Jesus.